by Goodspeed, Edgar Johnson, Goodspeed, Edgar J.
Goodspeed, Edgar Johnson, Goodspeed, Edgar J. The Apocryphaconsists of the books that are found in the Greek version of the Jewish Bible--the Septuagint, the earliest complete version of the Bible we possess--but that were not included in the final, canonical version of the Hebrew Bible. For this reason, they were called "Apocrypha," the hidden or secret books, and while they formed part of the original King James version of 1611, they are no longer included in modern Bibles. Yet they include such important works asThe First Book of Maccabees, theWisdom of Solomon,Ecclesiasticus, and the stories of Susanna, Tobit, and Judith, and other works of great importance for the history of the Jews in the period between the rebuilding of the Temple and the time of Jesus, and thus for the background of the New Testament. These works have also had a remarkable impact on writers and artists. Beyond this, they are often as powerful as anything in the canonical Bible. 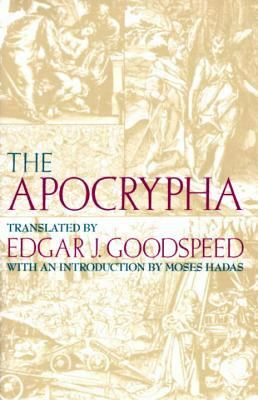 The translation into contemporary English is by Edgar J. Goodspeed.Goodspeed, Edgar Johnson is the author of 'Apocrypha An American Translation', published 1989 under ISBN 9780679724520 and ISBN 0679724524. Loading marketplace prices 22 copies from $1.64 How does the rental process work?